Strains and sprains occur when muscles, tendons or ligaments are overworked, twisted, or overextended damaging the fibers, tissues, joints and joint capsules in the affected area. Strains are usually less severe than sprains, but both lead to lameness and downtime for the horse. Muscle and tendon strains occur when overuse or overstretching of the horse's muscle or tendon fibers causes tearing or damage in the movement apparatus of the affected limbs. Characterized by painful swelling accompanied by lameness, muscle strains usually respond to massage, cold and heat therapy, and anti-inflammatory medications. .
Sprains involve a stretching or tearing of the joint capsule and the supporting ligaments caused by forced movement of the joint beyond its normal range. Sprains range from mild to severe, depending on the extent of damage to the fibers in the ligaments and any dislocation of the joint. As with strains, sprains usually respond well to anti-inflammatory medications and rest. Strains and sprains are caused by overuse or excessive use of the affected muscles, tendons, ligaments, and joint structures. In the case of muscle strain, the muscle fibers are stretched and torn. Injuries severe enough to cause muscle strain often strain ligaments and tendons as well. In racing and jumping, the longissimus dorsa muscle that runs down the back of the horse may be strained. Improperly fitted tack may be a factor. Stiffness, pain, dragging of hind toes, and muscle spasms are indications of this kind of strain. Horses are also susceptible to tendon strain, especially in the common digital extensor, the superficial digital flexor tendon, and the deep digital flexor tendon. When tendon strain is significant, the check ligaments are often affected. Joint injuries involve stretching or tearing of the joint capsule and its supporting ligaments. When a ligament is stretched or torn, it results in a sprain. Sprains may affect any of the joints and ligaments in the limbs of the horse, including the fetlock, the sesamoid ligaments, the knees, the sacroiliac, and the accessory ligaments. Horse handlers can play a role in preventing strains and sprains by developing knowledge of the capabilities and fitness of the particular horse, including awareness of any ailments or injuries that might affect performance. In addition, promoting good health through good nutrition, maintaining appropriate levels of exercise and activities, and using proper, well-fitting tack will also reduce the chances for injury. Treatment of both strains and sprains depends on the severity of the condition and the location of the injury. A slight or minor strain or sprain is usually treated with rest and pain relief. If the condition is at all severe, a veterinarian should be consulted to prescribe anti-inflammatory treatment, hot or cold therapy, support bandaging, and in the case of severe injury, X-rays to determine if bone fractures are involved. 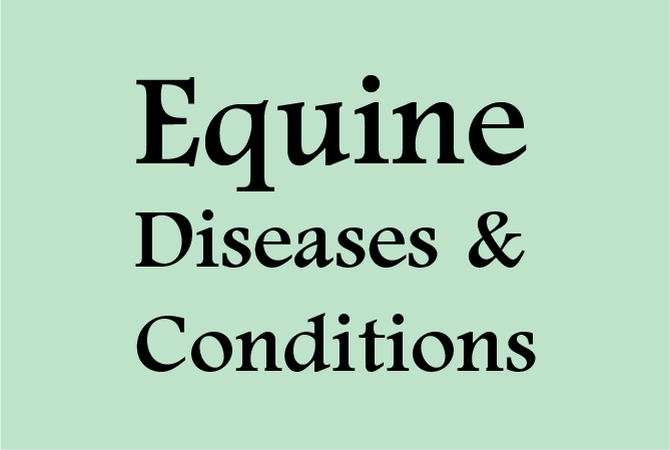 As with strains and sprains in humans, rest, relief of pain, and support of the affected areas usually enable the horse to return to regular activity levels unless the damage or injury is severe.